From left, Eva Bermudez Zimmerman, Susan Bysiewicz, Ned Lamont, and Joe Ganim. The four Democratic candidates running for governor and lieutenant governor fielded questions on Wednesday from constituents during a Hartford forum that produced rounds of applause and jeers as each candidate took a stab at proving their electability. The Hartford Votes-Hartford Vota Coalition sponsored an evening forum where candidates answered questions from moderator Diane Smith, a former News 8 anchor, and residents in the audience. 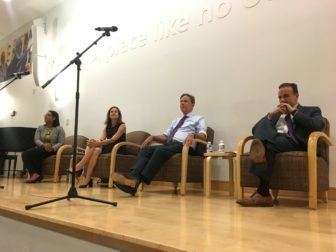 About 100 people came to the Hartford Public Library to hear the gubernatorial contenders, Greenwich businessman Ned Lamont and Bridgeport Mayor Joe Ganim, and lieutenant governor candidates, Susan Bysiewicz and Eva Bermudez Zimmerman, answer questions regarding education, immigration, policing, marijuana, and at times, even their perceived moral turpitude. Lamont, who unsuccessfully sought the governor’s office in 2010 but won the party’s endorsement in May, was quickly fielding pointed criticisms about his affiliation with the Round Hill Country Club in Greenwich— known for its exclusivity and lack of diversity. “When you talk about helping everyone, when you were in the country club for 16 years … why didn’t you fight for all people then for that diversity?” asked a woman in a “Ganim for Governor” T-shirt. Lamont noted Ganim doesn’t like “where I played golf 20 years ago, doesn’t like the car I drive, doesn’t like where I live,” before stating his commitment to fighting for all Connecticut residents. “I resigned (from the country club), and I’m here to fight for each and every one of you every day. I’ve got to convince you that I’m going to be a governor for all of our people,” Lamont said after being pressed to give an answer. Ganim said he has his own flaws, but didn’t specifically mention serving seven years in prison after he was convicted of corruption during his first tenure as mayor. Bysiewicz and Zimmerman each got a chance to explain why they are running for lieutenant governor and what they want to accomplish if elected. Bysiewicz, a former secretary of the state who is running as Lamont’s running mate, made the case, among other things, that she will focus on economic development, creating good paying jobs and helping the state invest in a new infrastructure and the educational system. Zimmerman, a labor organizer, drew fierce applause as she said she would fight to make sure Access Health CT is profitable and that everyone has access to health insurance. When Ganim called on his opponent to participate with him in a full financial disclosure statement, Lamont did not respond directly. Ganim challenged Lamont while holding a financial disclosure form for New York Governor Andrew Cuomo, and a CT Mirror article noting Bysiewicz’s challenge of Lamont on his decision to opt out of the state’s voluntary system of publicly financing campaigns during a candidate forum in April. Later, Ganim was challenged himself when asked whether he is holding accountable the police officers who were involved in a fatal police shooting of an unarmed Bridgeport teenager. During the tense, back and forth exchange with New Haven resident Ariva Walker, Ganim mainly sidestepped the questions, noting that tragedies involving police misconduct are handled by state authorities. Ganim said he has formed a group that includes law enforcement, community leaders, and people that advocate for victims, to meet with him on a biweekly basis to discuss those challenges, but Walker continued to press him about not taking action. The two candidates for lieutenant governor agreed Connecticut should legalize marijuana, but parted ways when 69-year-old Shirley Zachery asked whether they would both commit to being a dedicated public servant regardless of who wins the nomination to be their running mate in November. Zimmerman immediately said it was an easy answer. “So as a lieutenant governor candidate who is not aligned to any other candidate right now, my commitment is to the people, my commitment is to change … I’m giving my blood, sweat and tears in this because I’m frustrated and I’m right there with you every single day,” Zimmerman said, eliciting cheers from the crowd. Bysiewicz said she was proud to have received the party’s endorsement to be Lamont’s running mate. “I am supporting Ned, he is supporting me, and I’m looking forward to having our team win, hopefully, but all of the voters will have the opportunity to participate and decide,” Bysiewicz said.